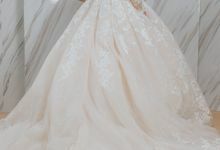 We need 4-5 months to customise a wedding dress. We advise clients to meet us way before the 5 months to discuss and do their confirmation in order for us to work on the fabric search and designs. We believe in quality and not quantity. Bride's ideas are important to us. Shairah Shazana is a passionate Bridal Designer that focuses on the sophisticated flair and timeless beauty. Her inspirations are encapsulated in several forms and clearly shown in the pieces that are created. 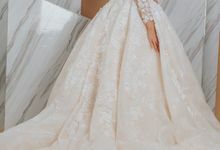 Wedding dress to her it has to represent who the bride is as that will make them feel beautiful inside out. She is a true believer of a timeless wedding dress that will never fade. " A bride has to look like a bride no matter how trendy she is" - ShairahShazana- Designing a perfect balance of traditional and contemporary, with plenty of chic is what she strive for. On the other hand, she also has plenty of gowns in her signature style — flowy, elegant and luxurious. Price can be the main concern and we are here to offer an affordable service and try our best to work closely within the budget. We also provide exclusive/premium packages.